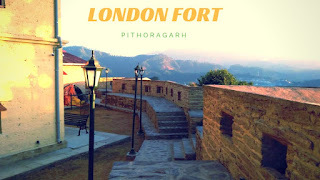 London Fort is the name of Pithoragarh Fort. In the borders of Uttrakhand to Nepal and Tibet a beautiful city, a hill station exists. Its name is Pithoragarh. This city is also popular as Soarghati & Mini Kashmir. But how it is named as Pithoragarh has different stories. One story says "Pithora" was the ruler of the city and "Garh" was his native place so the city was named to Pithoragarh. Another story told that this city has once seven lakes (Sarovar) which were dried by the times and became a Plateau (Pathaar) which further becomes Pthaargarh than Pithoragarh in Mugal Pronunciations. This historical building or fort in the name of Pithoragarh is commonly known as Pithoragarh Fort. In the times of Gorkha, it was called Gorkha Fort and "Baul ki Garh" sometimes. When the Britishers ruled Pithoragarh this fort was renamed as London Fort. Gorkha Fort or Baulkigarh was constructed by Gorkha Rulers in 1789-91 for the safety purpose. It was possessed by Britishers in 1815 after Sugholi treaty and renamed to London Fort. The fort is situated at the peak of the hill and designed greatly for defending fights from the enemy. From this Fort, King used to see Nine Thakur Forts ( Udaipurkot, Unchakot, Bhatkot, Dunikot, Vellorkot, Dungarkot, Balkot, Tharkot, and Sahajkot) which was clearly seemed from the London Fort around all direction. London fort is built on the area of approx.13300 square foot. Below are specifications of the Fort. Britishers used this fort as Tehsil administration till the independence of India. Post-independence of India it was used as Tehsil administrative works of Almora Districts later on for Pithoragarh District, but further involvements of social groups and government interference it was planned to open as a historical place and opened to all for a historical visit and tourist spot after its renovation. On 18th December 2018, this fort has been reopened for the public. The Fort was inaugurated by the state tourism minister Satpal Maharaj and Local MLA Prakash Pant. Watch the beautifully created video of the fort to understand it better. You must visit the Fort to know the vibrant History of Gorkha's in Uttrakhand. If you like the information provided here then please comment below in the comment box and share this article to your friends and family.